He met destruction so I wouldn’t have to. Without warning, I tumbled headfirst into the deep end. Unable to swim, I flailed, completely immersed, panicking with no ability to bring myself to the top. I could feel water searching for a way into my lungs. In an instant, strong arms encircled me and drew me up to safety. Coughing, sputtering, and crying, I clung to the one that held me. I was afraid, but I was safe. I was five, and I vividly recall wanting no further part in swimming lessons that day. I also clearly recollect the boy who pushed me in, but I’ll not throw his name under the bus. It’s realistic that I could have drowned that day were it not for someone who was my help and my deliverer. But of course, I tell you this story to point to a greater Help, a perfect Deliverer. In the moment where I thought I was drowning physically, I can emphatically tell you that I was not waiting patiently. Yet here the psalmist describes a time when he cried out to God, waiting patiently for Him. In his spiritual distress, he was given grace to wait. He waited, and he cried out–so simple, yet so difficult sometimes. But God in response did so much more. He drew me up from the pit of destruction. He put a new song in my mouth, a song of praise. God was the one who could save. He was the deliverer. He was the one who acted. In the immediate context, David reminds us that God hears our prayers and responds. His response may not be in our timing, nor in the way we think he will act, but he does hear. He does draw our fearful, anxious hearts from the miry bog. As a result, “Many will see and hear and put their trust in the Lord.” When I recall how I’ve received mercy, when others see God’s strong arms, together we praise Him! We sing, we shout to the God of our salvation! These are lovely, comforting thoughts. But there are far more radical implications to be gleaned. First, Jesus drew me up from the pit of destruction. He set me on a ROCK, which is himself. Through his death, burial and resurrection he made my steps secure. “You have multiplied O Lord my God, your wondrous deeds and your thoughts toward us; none can compare with you!” (Psalm 40:5) How my soul magnifies the ROCK of my salvation! Praise God for salvation by grace alone, through faith alone, in Christ alone. But secondly, we can view this psalm as if Jesus was the one who prayed it! Take a moment and let that sink in. Jesus came as the humble, obedient servant. God became the sacrifice. The priest became the sacrifice. The perfect one was cursed, so we could be blessed. 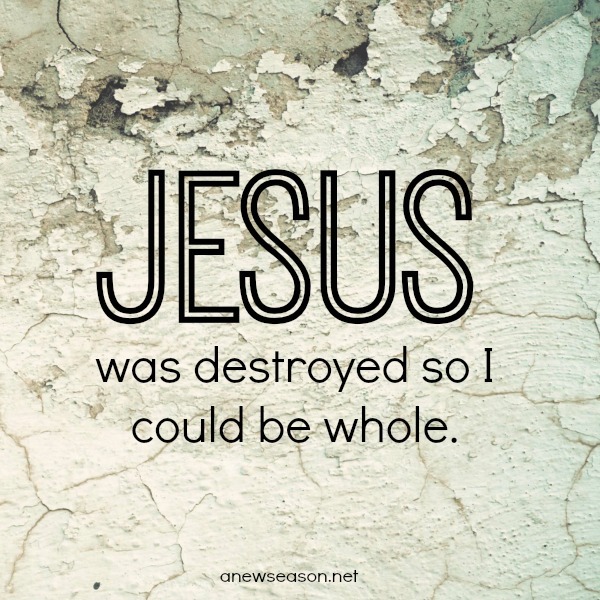 He took destruction so we could be whole. He went down in the miry bog of death, but he was raised again to life! Now from his place on the rock Jesus reigns as risen King! Rather, the immense beauty of Psalm 40 is that we have a Savior who prayed it perfectly. We have a Savior who lived it perfectly. Therefore, we have grace when we are weak. Father, thank you that Jesus faced destruction in my place. He bore the wrath that I deserved. Thank you for Jesus, the true Savior, the rock who made my soul secure. Thank you for Jesus who also rescues me when daily struggles threaten to drown me. When I think of all Christ has done, I can’t help but praise you! I can’t help but want to serve you always! < Previous It’s heaven because Jesus is there.